Why use the Clean Bean® Cleaning System? 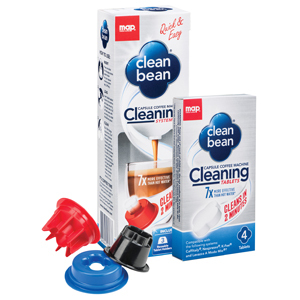 Clean Bean® is designed to remove the build-up of coffee residues and oils in the brewing chamber and delivery spout. Giving you a fresher, better tasting cup of coffee. Use between different beverages to stop cross-contamination of flavours. Clean Bean® is simple and quick to use. You can clean your machine in the time it takes to make 4 long black coffees! Clean Bean® tablets are free from phosphates and GMO ingredients. The tablet holder is also designed to be reused time and time again. Rinsing with hot water alone does not remove coffee oils and other beverage residues. The Clean Bean® tablet holder and tablet shape are registered design pending. “Clean Bean®” & “Cafetto®” are registered trademarks of Cafetto Pty Ltd. This product is not endorsed by the owners of these systems. Why do I need to descale as well as clean? Clean Bean® Coffee Machine Descaler is made from a blend of organic acids and is free from phosphates and GMO ingredients. Can be used on all coffee machine types including – capsule/pod, fully automatic, manual and even on kettles. 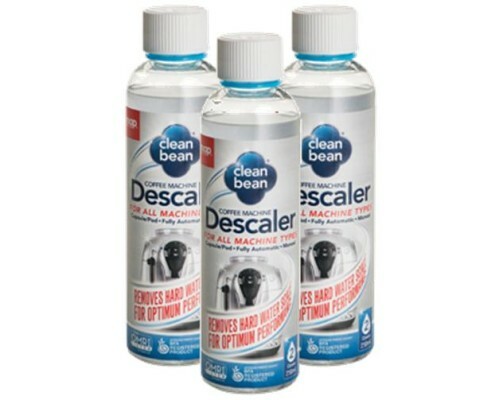 Unlike vinegar, Clean Bean® Descaler leaves no trace of odour. Clean Bean® Descaler is registered with two Organic Certification bodies. Our Frequently Asked Questions page will point you in the right direction.